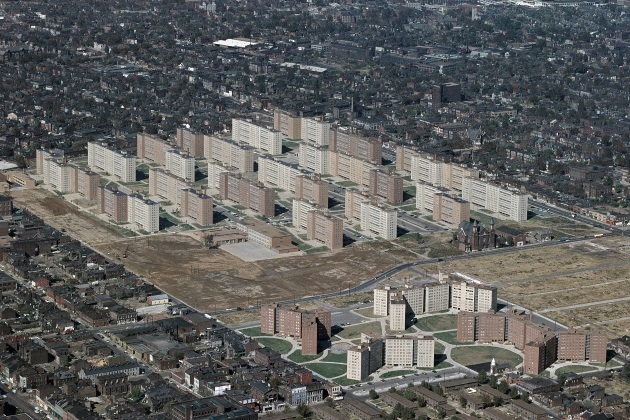 The tale of the Pruitt-Igoe public housing estate is perhaps the most widely told tale of public housing in the U.S. It has become part of the country’s urban mythology and serves as a pivotal vignette in the longer history of the evolution of housing policy in the U.S.
That story did not have a happy ending. A colossal project that dominated the city of St. Louis when it was built in 1954, it stood for less than three decades. Its demolition live on television in 1972 became a pop-culture moment that marked a watershed in what was seen as a failed experiment in public housing. Perhaps that makes it a good place to start. Pruitt-Igoe is often cited as the project that came to define urban America. And that is part of the problem. The powerful visual symbol of its end became something to be pointed to during the long demise of the concept of public housing in the U.S. Despite the high hopes and exhilaration when the first tenants moved in from the St. Louis slums, its apparent failure continues to give ammunition to those who believe public housing is doomed to fail. A utopian experiment and grandiose folly never to be repeated. One of the most accomplished tellings of this story is Chad Freidrichs with his film "The Pruitt-Igoe Myth." Friedrichs tells of how what seemed an “oasis in the desert” became in only two decades a battleground where even police feared to enter. However, Friedrichs refuses to accept the narrative that the architecture, or the very conception of the project itself, was to blame. Instead, he pans out to the wider forces that led to the downfall of these 33 ill-fated towers. Where does Pruitt-Igoe fit into the wider story told by this series? St. Louis lay along one of the major tributaries of movement during the so-called “Great Migration” that transformed American cities. The Pruitt-Igoe complex was built in the postwar 1950s in response to a housing crisis that saw economic migrants from the South pouring into a city that couldn’t cope with them, leaving them living in shamefully overcrowded conditions. In policy terms, the building was a child of the 1949 Housing Act — one of the most influential pieces of legislation in the story of U.S. housing, which promised to provide a decent home to every American in response to the growing slum problem in urban areas. Part of what the 1949 Housing Act did was brought in a renewed focus on urban renewal (read “slum clearance”) within the country’s struggling cities. St. Louis’ population was booming, and projections were for further dramatic growth, providing the rationale for vast areas to be cleared to make way for a new generation of high-rise towers. Viewing photographs of the original complex, comments from tenants that it looked like a “hotel resort” make sense. For those coming from the slums, these “poor man’s penthouses” opened up a whole new world, a living testament to the idealism of the times. However, some of the original and radical intentions of the 1949 Act were ultimately watered down. There are a number of possible explanations for why and how Pruitt-Igoe went downhill so quickly. Many have rushed to blame it on architectural details such as “indefensible spaces” and the alienating hubris of the modernist movement. But the tale of Pruitt-Igoe in fact has little to do with the number of floors, questions of whether you can build community vertically and the eternal standoff between modernists and traditionalists. Those are details to be argued over in architectural studios. In fact, it was arguably the less visible policy design, and unanticipated demographic movements, that led to the building’s downfall. Firstly, Pruitt-Igoe was born segregated. The Pruitt tower was designated for African Americans, and the Igoe tower for whites. By the time the building became reality, the Brown v. Board of Education decision had put an end to segregation laws, but that could not slow the beginning of the infamous "white flight." The 1949 Housing Act in fact exacerbated this “flight.” The Act did more than spark a surge in “urban renewal” — the flip side of the legislation was that it simultaneously increased the authorization for the Federal Housing Administration (FHA) mortgage insurance. While projects like Pruitt-Igoe were originally conceived as accommodation for the middle classes as well as low-income tenants, the boost the new legislation gave to home ownership helped those who could afford to (i.e., the largely white middle classes) to escape the city in their motor cars to the new Arcadia being created on the suburban fringe. This left the rest, the poorest of the poor, in what became the crumbling towers like Pruitt-Igoe. The population of St. Louis fell dramatically during the 1950s and ‘60s, helped by the slow decline of the traditional manufacturing industries that had been causing the city to thrive. Contrary to the forecasts of a continuing boom, the population of the city peaked in the early 1950s, as Pruitt-Igoe was under construction, and has been shrinking ever since — today it has lost 63 percent of its 1950 population. This was a master class in bad timing. This confluence of forces led the Pruitt-Igoe blocks into a downward spiral of falling occupancy rates. While the postwar housebuilding program provided capital to build complexes like Pruitt-Igoe, funds for maintenance were to be provided by the rent from the tenants. Consequently, as rent collection rates fell and maintenance suffered, more tenants left. Former tenants interviewed by Freidrichs talked of failed elevators and the exodus of security officers. And so the spiral continued. By 1971 occupancy had fallen below 35 percent. Abandoned by the rest of the city, social problems, crime and vandalism escalated at Pruitt-Igoe to the point where the authorities decided the only solution was to wipe the whole complex off the map and create a wasteland where it once stood. Sometimes one building can illuminate the story of an entire city. The Pruitt-Igoe story has for too long been hijacked as a pawn in the aesthetic debate between architectural modernists and traditionalists, or simply to point to as an easy dismissal of the whole concept of public intervention in the housing market. But there is much more to the story. Yes, we need to learn from the mistakes of many failed urban renewal project. But this is not primarily a question of changing architectural sensibilities. It may provoke a fear of high-rise, high-density housing, but it is telling that luxury high-rise towers in Manhattan are not torn down as detrimental to community building and social cohesion (Yamasaki, the Pruitt-Igoe architect, also designed the twin towers in New York). Reinforced concrete and architectural debate aside, the story of Pruitt-Igoe can be understood without even speaking to an architectural critic. There was much more going on beyond the drawing board on a much more systematic level that no building could remedy.